The fun-filled Festival is packed with a range of activities guaranteed to entertain, engage, educate and inspire all ages. Daily guided tours tell the colourful history of Northern Ireland’s only remaining Victorian theatre and visitors can enjoy the rare opportunity to stand on stage and operate the Theatre’s lighting and sound desks. There are also a number of creative workshops, including Flickerpix Ipad Animation, a fun way for kids to turn still images into beautiful and colourful sequences while learning about storytelling through animation. Young people can unleash their creativity and become master builders at the Clayrazy and Lego™ workshops using air-drying clay or Lego™ bricks to build specially designed models in a fun and interactive way. 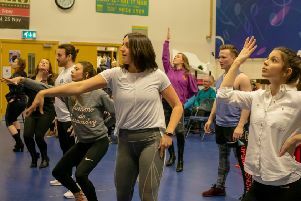 Street Dance workshops promise upbeat, high energy fun, as children get the chance to learn a funky routine to their favourite pop song, while three to eight year olds will enjoy a range of storytelling sessions. There’s also paper marbling workshops for budding artists to create a colourful masterpiece using paints and ink, and drama workshops where children can create, in under two hours, a whistle-stop performance of Peter Pan! On top of the programme of events, the Theatre’s foyer will come alive with face painting, treasure hunts, circus performers, balloon modelers, an eclectic mix of stalls, and lots more. Places for each event in the Family Festival are limited and should be booked in advance. Full details of the three-day programme, and booking, is available at goh.co.uk. Tickets can also be booked on 028 9024 1919.